JEGS.com Pro Mod duo struggles in N.J.
After both drivers made stellar runs in the first round of the Toyota NHRA Summernationals on Saturday at Old Bridge Township Raceway Park, Sunday was a struggle for the father/son JEGS.com team of Troy Coughlin Sr., right, and Troy Coughlin Jr.
ENGLISHTOWN, N.J. — The second round of the NHRA J&A Service Pro Mod Drag Racing Series race presented by Smithfield Foods and Western Beef didn’t go nearly as well — or as long — as the first round for the father/son JEGS.com team of Troy Coughlin Sr. and Troy Coughlin Jr.
After both drivers made stellar runs in the first round of the Toyota NHRA Summernationals on Saturday at Old Bridge Township Raceway Park, Sunday was a struggle. Neither driver was able to make full runs Sunday, and Troy Sr.’s day was essentially over before it had a chance to start. Facing Billy Glidden, Troy Sr. had an issue with his JEGS.com Corvette and was unable to stage. Englishtown fans enjoyed the apparent staging duel, but it was no duel at all. “There was an issue with the car and there was no reason to stage,” Troy Sr. said. “If I went up there with the mindset that, ‘My car is way better than his,’ why even go through something like that? As Glidden launched and made a pass of 6.020 seconds at 238.26 mph, Troy Sr.’s car finally was able to move after .321-second, and then his car went up in smoke as he pushed the clutch in on a 8.611-second pass at 114.44 mph. Troy Jr.’s day started better, as he left on No. 1 qualifier Mike Janis with a .044-second reaction time, but Janis’ .051 deficit was gone early in the run as Troy Jr.’s car got sideways at the hit. Janis’ pass of 6.009 seconds at 246.48 mph was more than enough to beat Troy Jr.’s 6.315-second pass at 243.59 mph. 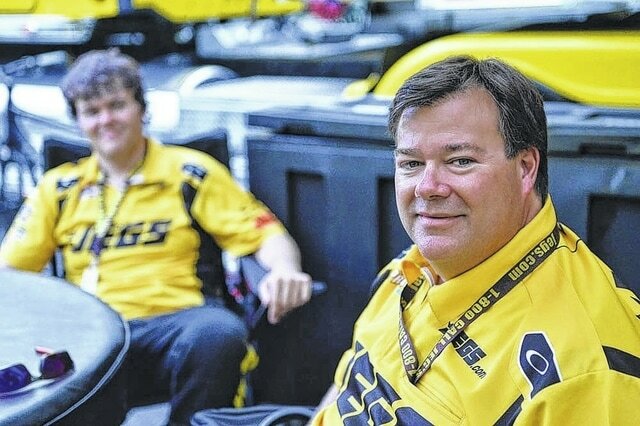 Teamjegs.com contributed to this report.